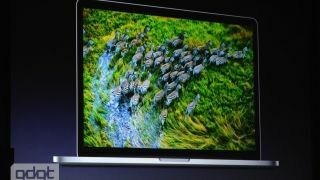 Apple has announced its latest MacBook pro line-up at WWDC and it's Air-like in size. The next-generation MacBook Pro, which according to Apple is the "most beautiful computer" the company has ever made. Personally we prefer the iMac. The notebook does come with a Retina screen, is 0.71-inches thick, is the lightest Pro ever at a little over 2KG. As it is Retina, it is the world's highest resolution display for a notebook (a phenomenal 2880 x 1800); plus glare on the screen has been reduced by 75 per cent and there's also a new OS to go with it, which accommodates the new display. According to Apple, Mail has been updated, Safari, iMovie and iPhoto - so they all take advantage of the extra pixels. It also means that something like Final Cut Pro can use Full 1080p. The Pro has some whopping specs. Even though it has a Retina display, there's seven hours' battery life, up to 16GB RAM and you can also have up to 768GB of flash storage. Ports-wise, there's an SD slot, HDMI, two Thunderbolt ports, USB 2 and 3 on both sides, headphone and a MagSafe power connector. Intrigued? We certainly are. The 15-inch MacBook Pro is available with a 2.3 GHz quad-core Intel Core i7 processor with Turbo Boost speeds up to 3.3 GHz, 8GB of memory and 256GB of flash storage starting at £1,799 ($2199). If you want to further and have had a nice chat with your bank manager, then you can have a 2.6 GHz quad-core Intel Core i7 processor with Turbo Boost speeds up to 3.6 GHz, 8GB of memory and 512GB of flash storage all starting at £2,299 - more in the region of $3,000. And Apple also muttered the magic words: "shipping today".